Mark: Quit talking. I’m sleeping. Me: Yes. In your sleep. You literally karate chopped my back! Mark: Oh, wow… are you ok? Me: Yeah, I mean, I guess so. I mean, ow. Ow. It hurts. Oh, no. I can’t feel my legs. My legs! Mark: Iamsosorry. I am sooo sorry. Do you need anything? Can I get you something? I’m so sorry. He’s so cute when I’m dramatic. Me: Oh, I’m cool. What was that karate chop about, anyways? Me: So you naturally broke out the karate chop. Awesome. 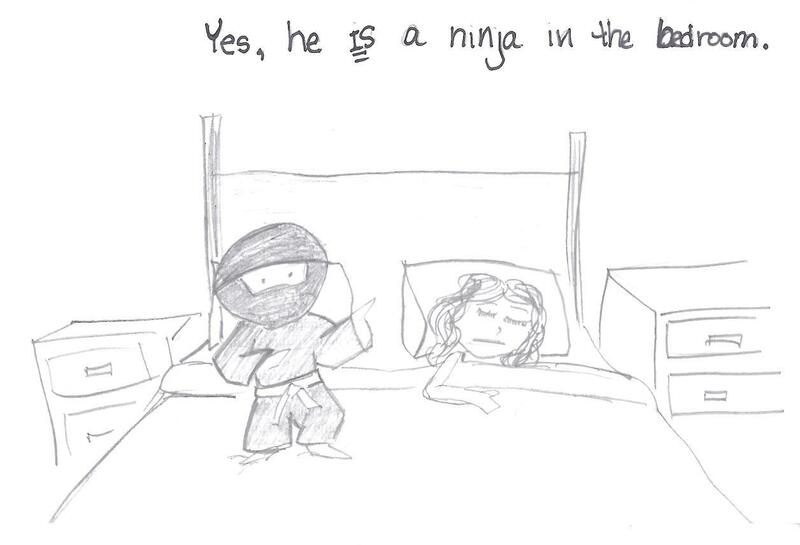 Sleeping with a ninja isn’t nearly as glamorous as it seems. you are such a good artist …you can draw really good and also a good actress….but are you really ok.
Ha, I’m glad you liked it! Right? And it did hurt. A little bit. I recently hit Jordan in my sleep. So you’re the spouse abuser in the relationship 🙂 And that “Nazi’s are coming” is freakin’ hilarious.